DC’s Crisis on Earth-X continues with our heroes separated and captured by Nazis with little hope of rescue or escape. Going into the third part the situation is grim. 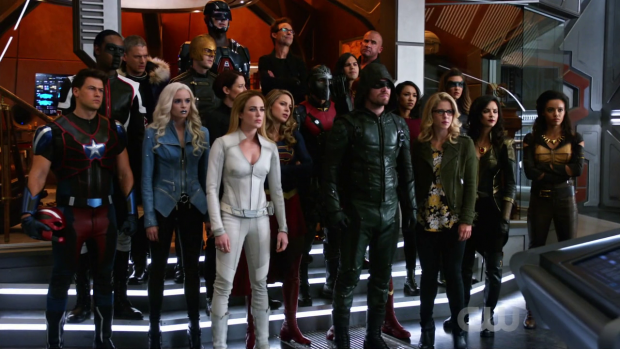 Oliver, Barry, Sara, Alex, Jax and Martin are stuck in an Earth-X concentration camp while Team Arrow, Cisco, Caitlin, Harry and Kara are trapped in the Nazi occupied S.T.A.R. Labs with Iris and Felicity as their only hope of rescue. As I said in yesterday’s review it’s a good starting point for the middle point of the story as the heroes are at their darkest point and have to build their way back to victory. It’s classic story structure and perfect for a narrative like this. The most interesting scenes take place on Earth-X as they build a really hopeless atmosphere that the characters have to combat. It doesn’t become too morbid or depressing which is surprising given the subject matter and the brief early scenes allow the characters to play to their strengths. Instead of admitting defeat they all focus on finding a way to escape. Oliver takes on a natural leadership role and attempts to keep everyone calm while Sara plays the strategist working on the best method of escape. It’s true to the characters and keeps the momentum going in a fairly static location. Unfortunately this doesn’t quite pay off as they are saved by circumstances rather than anything they do though the arrival of the Earth-X version of Leonard Snart goes a long way towards making up for that. Wentworth Miller has yet another opportunity to chew the scenery as this alternate Snart who shares the same mannerisms as his Earth-1 counterpart but is more compassionate and sympathetic. It makes this version distinctively different without sacrificing any of his fan pleasing quirks that can only be delivered by Wentworth Miller. Leo -as I’ll refer to him from now- is different from Earth-1 Snart in other ways such as his approach to planning. Barry and Snart’s team-up last season gave us his approach to planning that hinged on things going wrong and the plan being abandoned as a result. It’s written off as a gag here when Leo reveals that his plans are intricate. His line about that being horrible advice is really well delivered with the added meaning attached to the fact that he’s talking about another version of himself. Having the characters imprisoned in the same place as his boyfriend Ray Terrill aka the Ray (Russell Tovey) is more than slightly coincidental but justifies the reason for Leo rescuing them. It’s a very small point that shouldn’t be lingered on as it allows the story to move onto bigger and better things though I’ll admit I might have enjoyed seeing the group participate in a The Great Escape style plot where they used their wits and skill to regain their freedom. It wouldn’t quite have fit the overall tone of the crossover but it would have been a good showcase for the various characters. One thing the second half of the crossover does well is establish and explore the relationship between the Ray and Leo. There is so little screen time devoted to it but what we get shows how deep that relationship is and holds it up as an example of what everyone is fighting for. It adds personal stakes to the struggle on Earth-X as we see two people in a lovingly committed relationship fighting for the right to have that relationship. Considering how shallow Earth-X is as a setting this is vital to making sure it isn’t disposable as it adds a distinctly human perspective to the hardships people face under the rule of a totalitarian regime. The line “I loved the wrong person” perfectly encapsulates how ridiculous the intolerance is and gives much needed depth to the overall conflict. The relationship comes through strongly thanks to the chemistry between Wentworth Miller and Russell Tovey. It comes across that they have hope that they will succeed because of each other and that they have been together for a long time. Their relationship is passionate yet feels lived in and it’s easy to root for them as characters because of this strong connection. This proves vital for the Ray as he suffers from a lack of development thanks to a lack of screen time due to the crossover being a very busy story. His scenes with Leo establish his motivation, what he stands for and how he feels about the situation which is definitely enough to go on for the purposes of his role in the story. Visually he’s very impressive with a well defined power set and a really cool costume that lets him blend into the overall aesthetic of these shows. His participation in the action sequence where he teams up with Barry against Red Tornado makes for really impressive viewing and shows a hero comfortable with his powers while being skilled at thinking on his feet. It’s a really economic way to impart important information to the audience and allows him to take centre stage for a brief moment. Barry is very much the secondary player in that sequence which was definitely the right move. Leo comes off better as a character though it is easier to fill in the blanks thanks to prior experience with a different version. The way he interacts with the other characters is instrumental in exploring the differences as well as the similarities. There is his approach to planning as mentioned above but there are other things that build his personality. His overwhelming optimism is well established as is the sense that he has a lot of fun doing what he does. Wentworth Miller does a great job building this character in short bursts thanks to these key scenes. The jovial way he conducts himself around more serious characters like Sara and Oliver makes him an effective comedic foil for them and allows the Earth-X scenes to be lighter than they otherwise would be. I especially liked his interactions with Mick. Their partnership was very well defined so it’s great to see a riff on that in a way that is both hilarious and meaningful. Leo trying to convince Mick to be more in tune with his emotions was well done and didn’t play out in the predictable way of Mick quickly agreeing with him. I’d like to see more of this alternate version of the relationship. One thing that didn’t quite work was Leo’s decision to stay on Earth-1 for a while. The episode doesn’t give a good reason for him to do this though his parting scene with the Ray is a very sweet and sincere moment. I am looking forward to seeing how Leo will fit in on Earth-1 but I’m also confused as to why he would willingly abandon his cause of saving Earth-X It’s something that both works and doesn’t. Earth-X provides an opportunity for Sara and Alex to discuss their recent fling. Alex has largely been avoiding her so forcing them together is a good way to organically let this conversation happen. I criticised the previous episode for stopping in its tracks to allow various pairs to talk about their feelings but this felt much more natural. It comes after the reveal that Kara is required for a heart transplant to save the life of her evil duplicate so Alex is understandably concerned that she isn’t in a position to help Kara. She is determined to make it back to Earth-1 and save her sister with no intention of letting anyone convince her otherwise. This provides the meat of her conversation with Sara rather than obsessing about their one night stand which is a far better approach as it allows for character development while retaining the focus on the actual plot. It reminds us what is important to the characters as well as the overall story in a really succinct and satisfying way. Alex’s devotion to Kara is very well established to fans of Supergirl so her motivation here is clearly in character. Adding an extra layer to this is that she really wants to get home so that she can undo the mistake she made breaking up with Maggie. Sara is able to support her on both aspects as she makes it clear that Alex isn’t alone in her desire to return to Earth-1 to save Kara. Her natural leadership skills come into play when she assures Alex that she will do anything to protect her team. Naturally Alex is currently part of that team so there’s no reason for her to feel isolated. Sara also makes the point that Alex should trust her instincts as she already knows that she is the sort of person with very keen instincts. As far as Sara is concerned if Alex makes a decision then there’s a very good reason for doing so and she shouldn’t let an intense situation get in the way of that. She also brings up their passionate encounter in a very casual way to help Alex feel more at ease about it since she doesn’t see it as a big deal worth obsessing over. It’s a great conversation and clears the air between these characters nicely. It also pays off towards the end of the episode when Alex thanks Sara for reassuring her about the sort of person she is while Sara starts to consider that there might be a more permanent romance in her future. Encountering Alex has made her think back to her time with Nyssa and the way that made her feel giving the impression that she might like to feel that way again. The situation on Earth-1 allows Iris and Felicity to take charge of the situation in a way that really works. They both acknowledge that they aren’t enough to take on the combined might of Evil Oliver, Metallo and a contingent of Nazi soldiers but they can use their knowledge of S.T.A.R. Labs and their other skills to their advantage. Iris knows the layout so knows what needs to be done in order to shut down the power and Felicity has the technical knowledge to make it happen. They make for a good team and their contribution feels realistic. Their capture by the soldiers could be seen as a simple “damsels in distress” outcome but it’s important to consider what they accomplished before that point. Shutting down the power delayed the procedure being performed on Kara as well as providing her with a chance to recover. They also managed to signal for help in the form of the remaining Legends so they did manage to prove useful up until their inevitable capture. Kara being incapacitated with the very real threat of an operation being performed on her was really effective in creating tension. 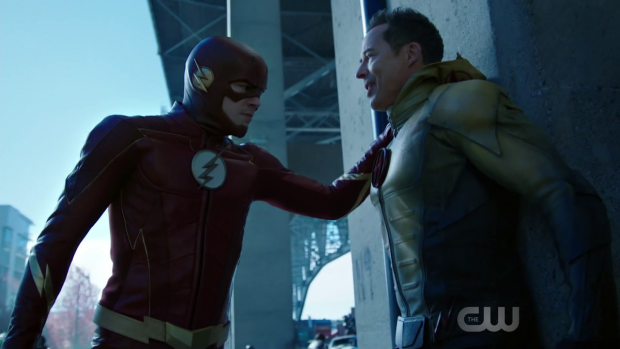 It always seemed as if the procedure was imminent and Tom Cavanagh does an excellent job adding to that sense of inevitability.The tease of his battle with some version of Superman in the future has me hopeful for Reverse Flash appearing on Supergirl at some point. The best thing about Kara’s interactions with Thawne is that it’s clear she isn’t afraid of him. Naturally she’s afraid of the situation but she handles it with a profound sense of decorum that shows just how heroic she is. She is content to accept her fate and not give Thawne the satisfaction of hearing her beg for her life. Kara even promises retribution after her death to remind Thawne that she has friends rather than temporary allies. Kara’s interactions with Evil Kara are also revealing as it delivers insight into what these characters believe at the core of their being. As we know all to well by this point Kara firmly believes that her powers are a gift that should be used to protect others where Evil Kara thinks that they make her better than everyone around her. She sees humanity as being weak and Kryptonians being strong so it’s obvious to her that Humans should be ruled over rather than protected. It’s fairly obvious stuff but also clearly shows that Evil Kara’s mindset is a perversion of Kara’s as their views on how their powers should be used are essentially opposites. Melissa Benoist continues to impress with her dual performance. Evil Kara is very different but there’s something familiar about her which makes it even more unsettling to watch. There is a systemic problem with the Nazi versions of Kara and Oliver. Thawne is fine because it has already been established that he is self serving and doesn’t care what harm he causes in pursuit of his goals but Evil Oliver and Evil Kara represent something that isn’t explored. The “nature vs. nurture” debate is popular in fiction and for good reason. People potentially turning out differently because of a change in circumstances is a very interesting prospect especially in alternate reality stories. The problem here is that Evil Oliver and Evil Kara are the way they are because of the circumstances of their upbringing which completely neuters the nature side of the equation right away. If that’s the story the writers want to tell then that’s great but it fails to land because the characters don’t react in any meaningful way to that. How does Oliver feel about the fact that he could so easily be a monstrous dictator with a few changes to his life? Kara should also be concerned that her compassion for others isn’t necessarily innate especially considering the apparent proof of that is staring her in the face. It would be different if she saw a hint of that compassion in her counterpart but that never happens so it would have been good to see some kind of doubt on the part of Oliver and Kara. It could be argued that the overall plan to spread the Reich across the Multiverse starting with Earth-1 is just as expected for a story like this and therefore boring. I can see why people might think that but I didn’t have an issue with it as it keeps the focus on the heroes coming together to bring down a threat that is bigger than any of them alone. There are tropes to be laughed at such as the substandard aim of the Nazi henchmen and the various coincidences but as a story about a community of heroes collaborating it works gangbusters. There is a concern that an event like this could lack stakes in the long run because they are pulling elements from multiple TV shows that need to go back to where they came from. The immediate assumption is that everyone is safe because the impact on the individual shows should be relatively minimal. This was certainly true of last year’s “Invasion” event and I’ll admit that I had the same thinking here. 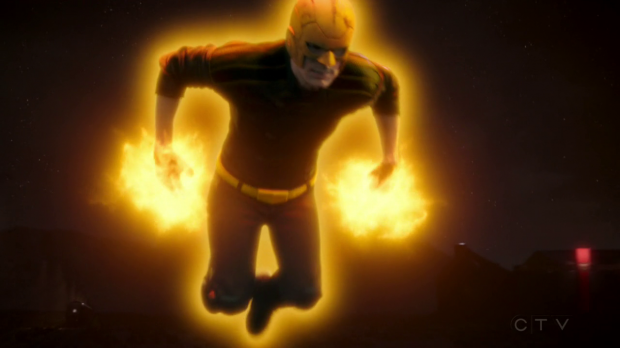 I was very impressed that Crisis on Earth-X countered that expectation by not only killing a major character but making it matter in a really big way. It was revealed a while back that Victor Garber was leaving DC’s Legends of Tomorrow but the how and when remained unknown. 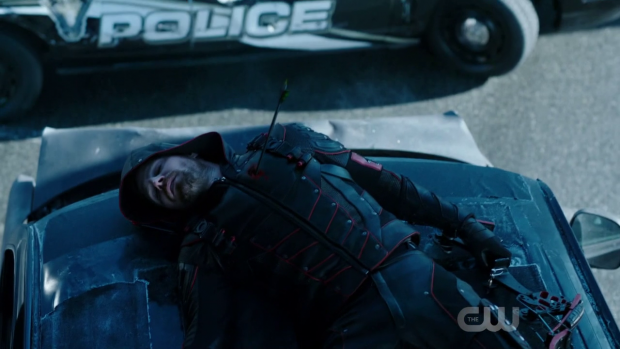 His death in this episode was a surprise as I didn’t expect it to happen this way even after he was shot. 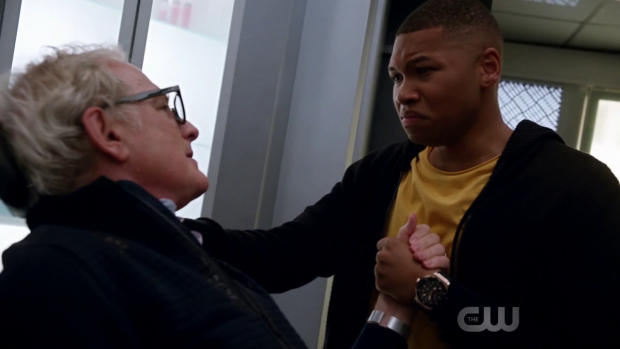 It was beautifully handled thanks to strong performances from Victor Garber and Franz Drameh who do an excellent job playing up the father/son connection as well as Jax losing a literal part of himself. They have a wonderfully sincere moment where Martin admits that Jax is a better son than he could ever have hoped for. It reminds the audience of how strong the connection between them is. Scenes like this are so effortlessly handled because they are earned. The scene where Jax says goodbye and breaks the connection with the cure to save himself is one of the most moving scenes any of the shows have had thanks to the time spent building this relationship. Martin’s death resonates through practically the entire cast thanks to the impact he has had on the universe as a whole. His time on The Flash means that he has a strong relationship with those characters, his role in DC’s Legends of Tomorrow is well defined and it’s clear that the Arrow characters don’t want to lose someone beloved by so many. Kara and Alex aren’t seen reacting which is fair enough considering they don’t have a connection to him. The beauty of it is that in the midst of a race against time to bring down the Nazis the episode slows down to allow Martin’s death to resonate. 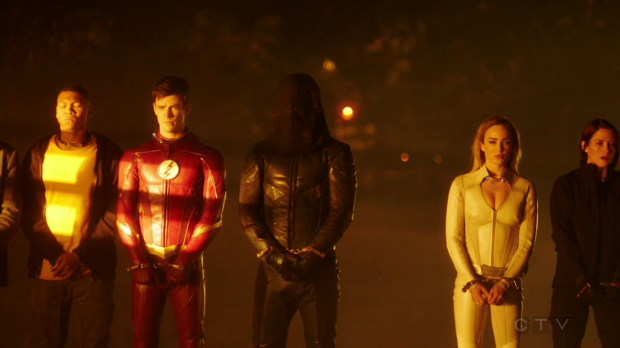 Showing the reactions of everyone he was close to makes this something that resonates across the entire shared universe and gives it meaning far beyond what could be shown in an episode of DC’s Legends of Tomorrow in isolation. I applaud the decision to do this in a crossover event and was incredibly moved by the execution. Action is something that this event consistently delivered. In particular the climactic sequence was an immensely entertaining spectacle. Each character had a moment to shine and Oliver’s victory over his evil duplicate was a really satisfying moment that would have resonated more had it been a victory of his darker nature though that was never something that the event was interested in exploring. The same applies to Kara though the reference to an iconic Superman II line was brilliantly delivered. This extended sequence in particular was varied, dynamic and felt impactful thanks to the underlying motivation of fighting to avenge Martin. It’s also a lot of fun seeing these characters brought together in a large scale beatuflly choreographed action sequence. The wrap-up did feel somewhat bloated though that was to be expected considering the sheer scope of the event. Individual scenes were strong such as the afore mentioned Alex/Sara scene but there were an awful lot of similar platitudes involving characters saying goodbye to one another. The double wedding of Barry and Iris as well as Oliver and Felicity wasn’t something I was interested in but that’s because I’m not invested in those relationships so there’s nothing there for me. I also found Barry’s vows to be painfully wrought with clichés that only serve as a reminder of how poorly developed this relationship is. 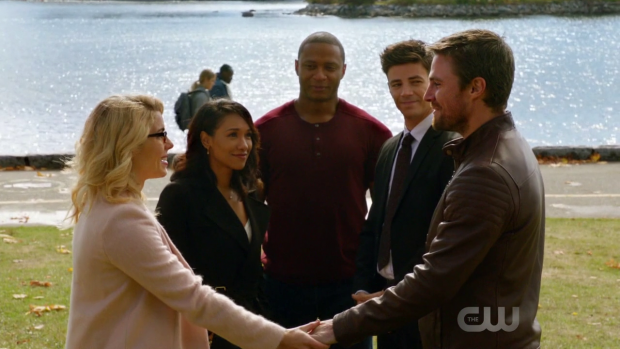 Oliver’s quickie vows seem a lot more sincere though there’s nothing particularly good about them either. At least we got to see Diggle for the first and only time in the entire event. It’s a shame he wasn’t a part of it. I would say that this is the best live action example of a superhero event comic. The story itself is reasonably self contained with some attention paid to various character stories. If there’s no personal input from the characters then there’s no point in them being there so it’s important to get the balance between creating a story that everyone can follow while providing enough fan service for fans of given characters. Broadly speaking this crossover gets that balance right though there is perhaps too much focus on the Barry/Iris and Oliver/Felicity relationships. Mileage will vary depending on individual investment but at least there is plenty going on elsewhere to offset it somewhat. The action was wonderfully handled throughout and the character interactions were always a joy to watch. Even though the villain characters and motivations weren’t all that well established there was still more than enough to carry the story as intended. Adding the death of Martin Stein and really making it matter to most of the characters was a brave decision that really paid off. 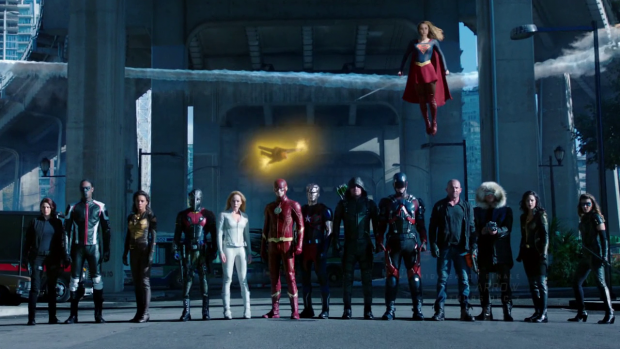 It added depth to the climactic action sequence and let the death e something that resonates across the entire Arrowverse. The wrap-up felt somewhat repetitive and overlong which was expected given the sheer scope of the event and the double wedding was rife with clichés especially where Barry is concerned but any criticisms are minor compared to how well this entire endeavour is pulled off. It’s certainly going to be difficult to beat next year.